When we made a remark about the yolks’ bold, dark-orange hue, Chef Max said that this characteristic hinted at the hens’ excellent nutrition. In this land of authentic Parmigiano-Reggiano, Chef Max added copious amounts of the beloved cheese, noting that the grated batch had been aged for 24 months. He also added ricotta to the gloriously-golden, creamy mix before pouring the concoction into muffin tins. As the soufflés-to-be were put into the oven, Chef Max and his assistants — like a cadre of busy elves — set to work showing us how to make gluten-free gnocchi, grilled duck, and a chocolate torte. The aroma of melted butter, cacao, cheese, and pasta danced in the air. 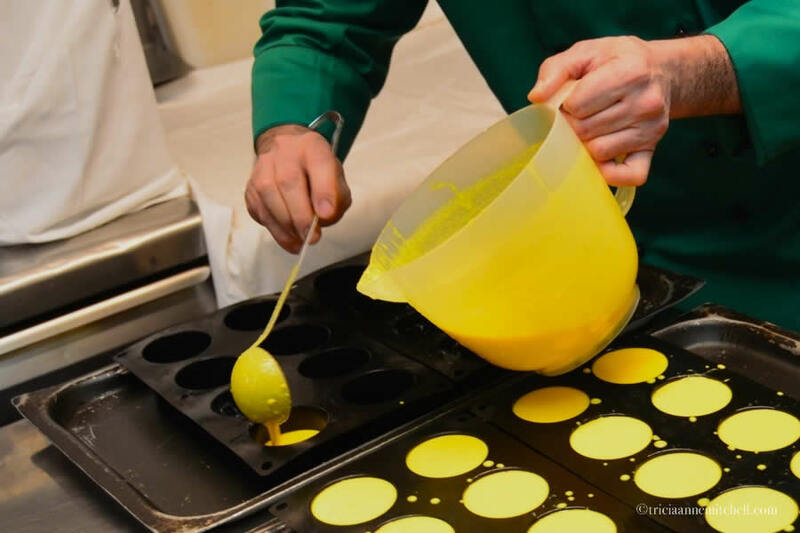 As substitutes to traditional wheat flour, Chef Max used gluten-free blends made with corn, rice, potato, and even buckwheat flour. After all the dishes began cooking, we set off to explore the interior of the cozy eatery. In the early 18th century, the grounds on which the restaurant is now situated belonged to the Countess of Hanover. They housed a stable, where the Countess’ horses were kept. 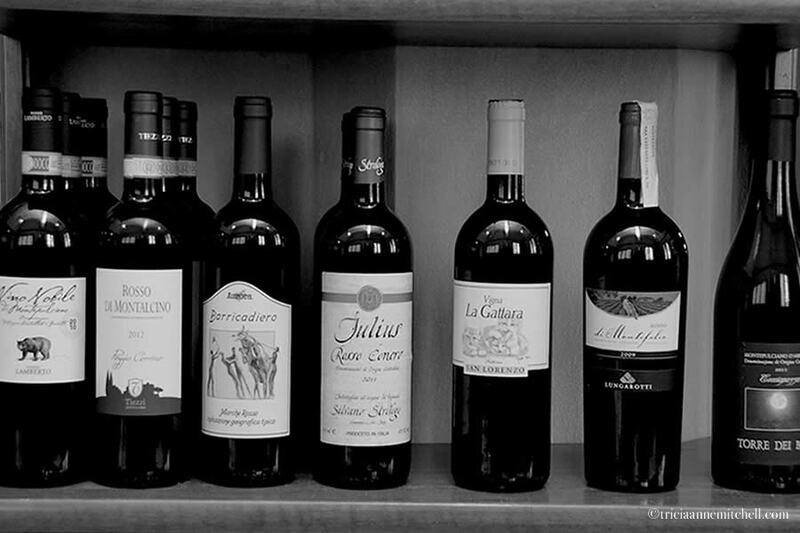 Today, the Stallo del Pomodoro’s interior is embellished by black & white posters, a vintage radio, and shelves filled with a significant wine selection, the latter of which we’d get to enjoy during our lunchtime feast. Soon, a triumphant parade of courses streamed through the kitchen door. Each plate offered novel flavors and spices, including fava tonca or tonka bean (a legume with South American origins, it’s curiously banned in the United States). By the end of the meal, we felt comfortably full, thanks to the richness of the cuisine and the reasonable portions Chef Max and his team had created. A group of local winemakers who’d been dining at a neighboring table, swung by to offer us complimentary glasses of their delightful wine. Had we not had a full afternoon dedicated to seeing more of Modena’s highlights, we could’ve chatted with these friendly vintners for hours. We reluctantly left a short while later, feeling grateful that Chef Max had shared some of the region’s culinary secrets with us. The cozy Stallo del Pomodoro restaurant, which was once a horse stable. Shawn gets suited up for cooking class. Gluten-free gnocchi in the making, made with rice, potato and corn flour. Golden-toned ingredients for Chef Max’s Soufflé di Parmigiano: Parmigiano-Reggiano cheese, eggs, and Ricotta cheese. Spooning the Soufflé di Parmigiano mixture into muffin tins for baking. 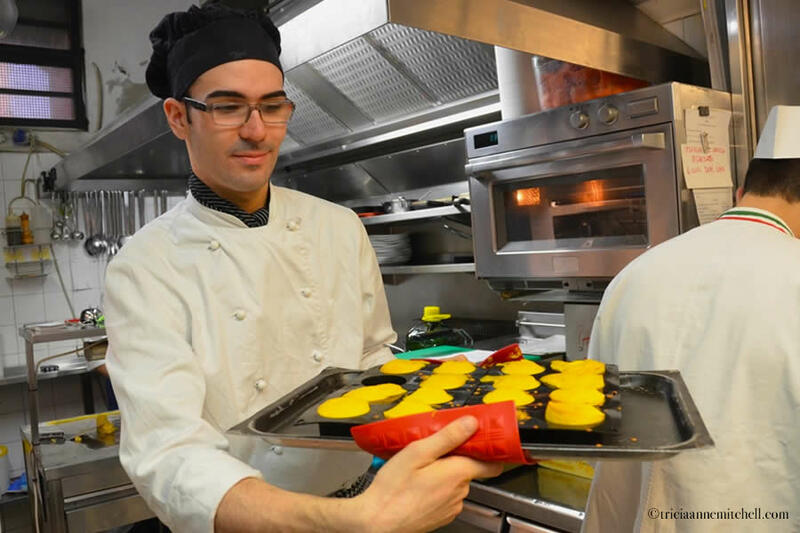 Chef Max’s assistant, Riccardo, checks on the vibrant-colored Soufflés di Parmigiano. Next, Chef Max sets to work in making dessert, Tortino Ciocallato, or chocolate tortes. The first step is to melt copious amounts of butter and cacoa chips. Later, that heavenly blend will be mixed with flour, vanilla powder, and eggs to create a torte filled with pears. English Cream and confectioner’s sugar will be the finishing touches. 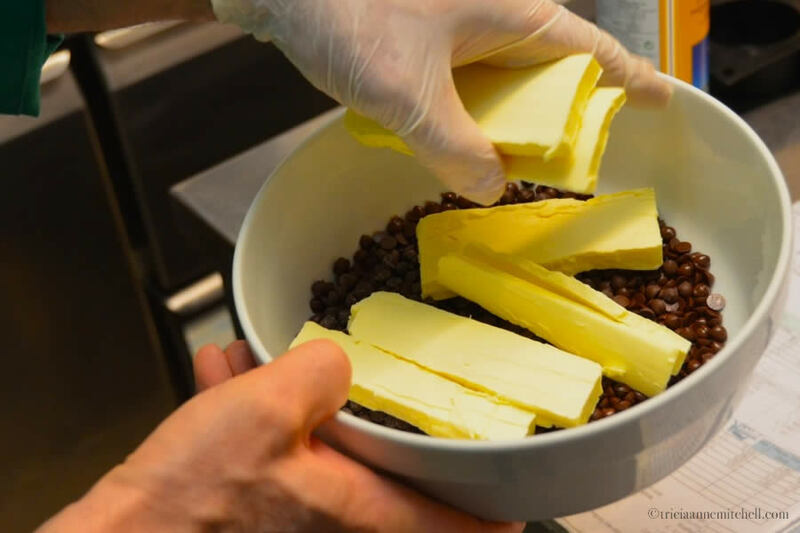 Chef Max carefully pours the rich stream of melted chocolate and butter into a muffin tin, ready for baking. With the shadowing portion of our cooking class complete, Shawn and I pose with the ever-patient, carefree Chef Max before heading to the restaurant’s dining room. Shawn prepares to dive into a Crêpe with Ricotta & Radicchio Pesto, which was dusted with fava tonka powder from South America. 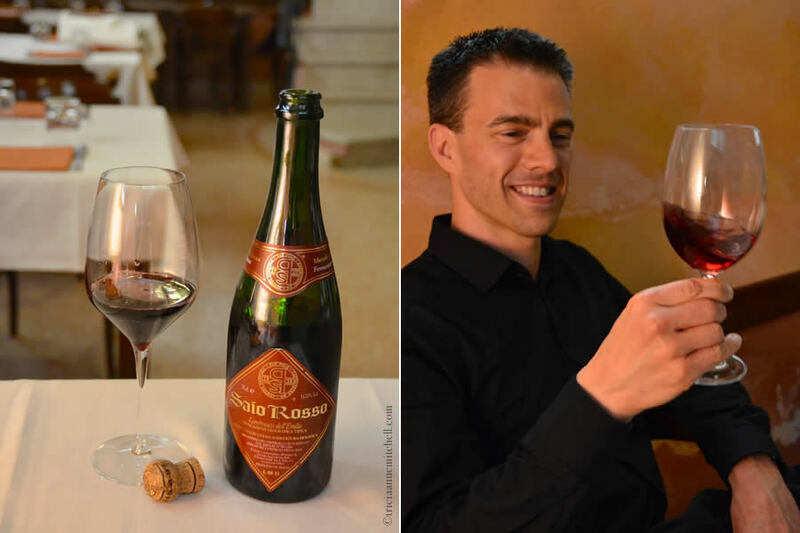 Saio Rosso Lambrusco, a delightful, fizzy red wine from the region, which at 11.7%, has a relatively low percentage of alcohol. 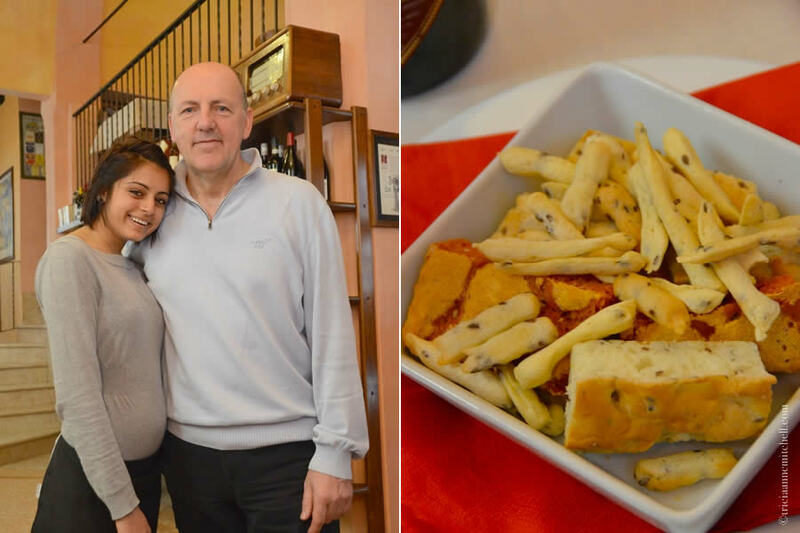 Restaurant co-owner Nunzio poses with the Stallo del Pomodoro’s delightfully-friendly waitress, Jejek. On the right, the gluten-free bread and bread sticks that nearly brought me to tears because they were so good and I hadn’t had ‘real’ bread in so long. Varieties included flaxseed, rosemary & tomato. The chocolate torte, resting atop a swirl of English Cream, and dressed with confectioner’s sugar and cacao. It was perfectly paired with espresso. Stallo del Pomodoro staff members mingle with vintners from the region who very generously stopped by our table to share their wine with us. 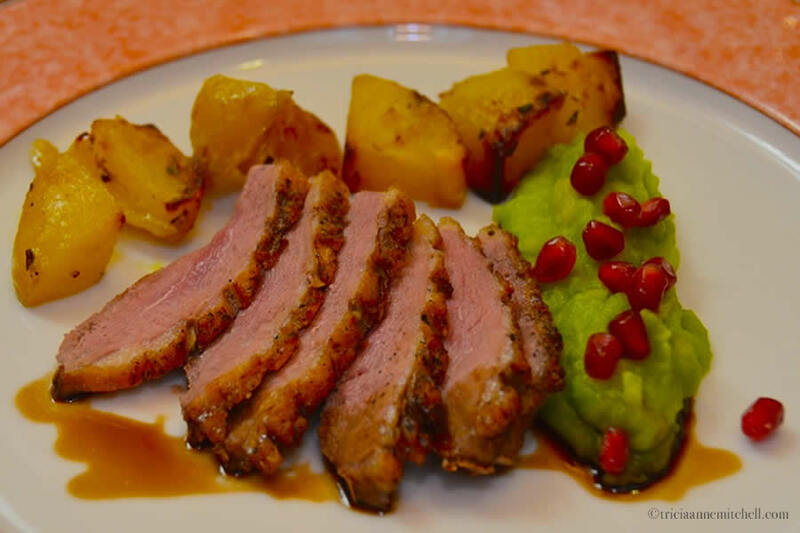 The Osteria Stallo del Pomodoro is located in the heart of Modena at Largo Hannover 64. Touch base with them to coordinate a cooking class experience, or simply go there to enjoy their fantastic fare! Such a rich post, incredible photos and the story behind the photos as well. 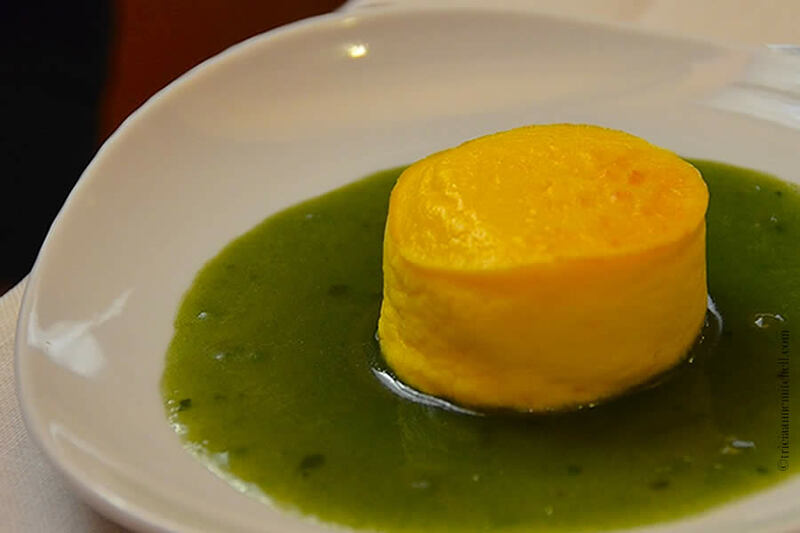 I like the mention of using the best ingredients, I perked up with this, as I miss the rich golden/red yolks of eggs from the countryside, they taste so much better. 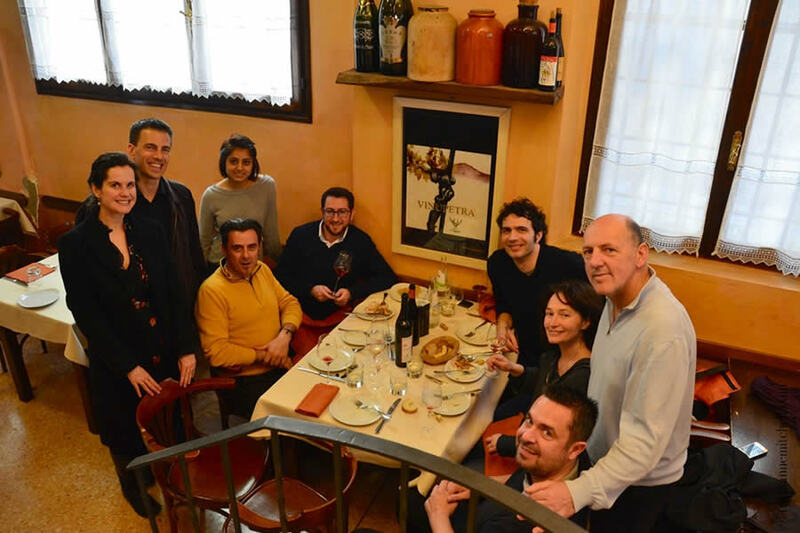 Sigh…the Italians/French sure know how to cook, and to learn from experts is great but what would interest me most is covered in the video: tasting the great food (and then of course finishing it off with some nice wine!). Beautifully done Tricia! Randall, we remarked that because the ingredients were really rich, they helped us keep our appetites at bay. If an additional Soufflé di Parmigiano (or two) had been presented to me, however, I probably wouldn’t have passed it up. Ah, it was so good. Ha, ha, just after reading your post I told my friend that while I do a pretty well watching what I eat (portion/healthy) at home ~ when I go to a restaurant it is a treat I take full advantage of, it looked so good. Wish you safe travels and a delectable bunch of dumplings! Are those the ones you wrote about some time ago, from the family-run establishment? Oh my gosh, lucky you, Tricia! Leigh, thanks so much for sharing the post. 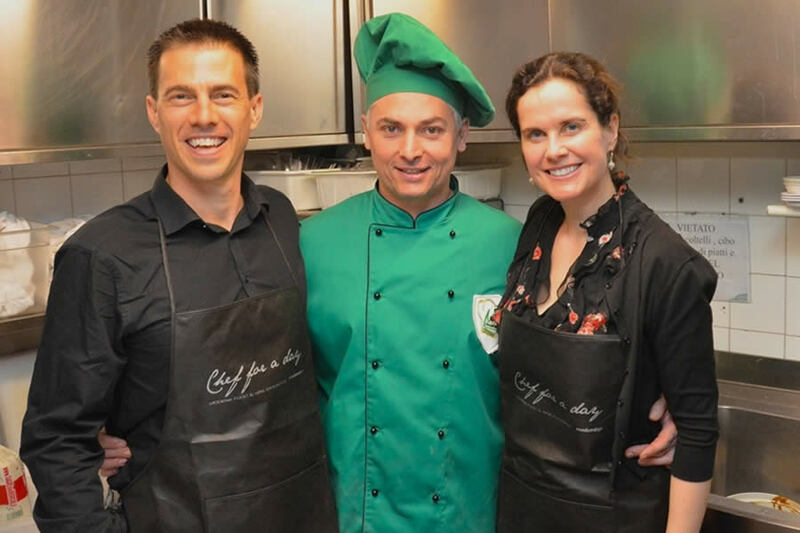 To describe this is as a “dream cooking class” is fitting – especially since these talented chefs and cooks were creating wonderful, gluten-free, slow-cooked food. Hope you get to have a similar experience in the future too, and thank you for joining us. How beautiful your photos are. It sounds like you had an amazing meal. Carol, with all the important ingredients present (great food, wine, and welcoming people), we certainly did. :) I wish I could come close to making the exemplary soufflé and gluten-free bread that Chef Max did. Yum, I always make the mistake of reading your post just before lunch! Ok it’s not really a mistake. Oh wow! Leigh at Scribblings from the Bluegrass lead me here! So glad she did. BTW, our chickens lay eggs with rich, orange yolks like that. They get to pick out tasty morsels from the grass and eat real food to their heart’s content. food is becoming such a contested issue here in the US; with Monsanto pumping millions into defeating mandatory GMO labelling. And, yet, our health and wellbeing boils down to pure, unadulterated food. It truly is the best health insurance! Annette, I agree with your statement about pure food being the “best health insurance.” Well said. A few sources have now told us that the rich, orange yolks are indicative of the chicken’s healthy diets and the egg’s excellent nutrition value. We encountered eggs like that in Croatia, Macedonia, and Germany, and I know they’re out there at other small markets. How wonderful that you have your own eggs like this! How many chickens do you have? Especially love the look of the duck, though I’d settle for any of it. Ciao Terri! I will not deny that cheese and chocolate are two of my vices. :) Having visited a Parmigiano-Reggiano cheese producer just outside of Modena, I also gained a greater appreciation of the cheese that extended beyond its flavor. Just like a symphony, the production is well orchestrated from the beginning – the cows are fed a healthy diet, they’re treated well, and one of the employees we met there seemed to be putting a lot of love into what he’s been doing for several decades. I think Chef Max generally makes gnocchi and other dishes with gluten, however, since he’s a gluten-free expert and cookbook author, he can make the shift between gluten & gluten-free practically effortlessly. He seems to instinctively know just what type of substitution needs to be made to make a gluten-free dish unrecognizable from its gluten-containing counterpart. It seems to require a definite food chemistry balance. Having been gluten free for nearly two years, I really almost did have tears of happiness when his team brought out my plate of bread. It was so good Shawn wanted to devour it too. 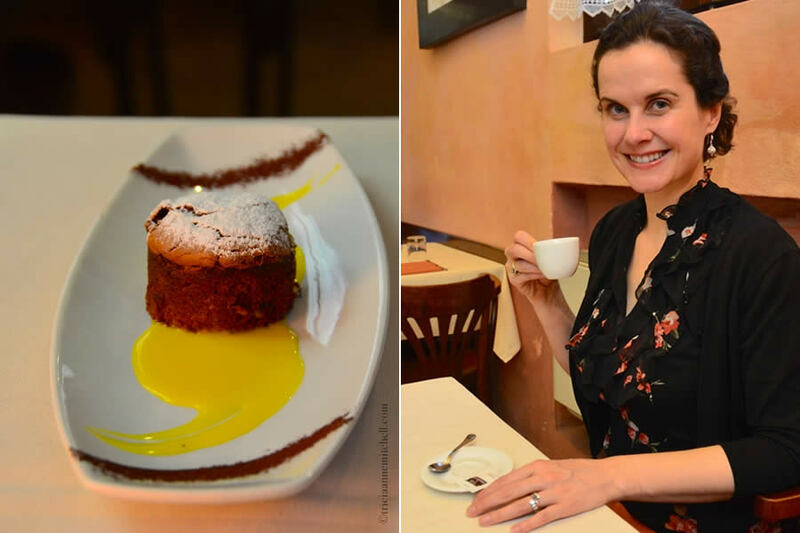 :) We found that the Italians are the most well-versed on celiac disease and gluten-free dining. There’s much awareness for people’s sensitivities, and I read somewhere that they’ve been cooking with different types of flour (buckwheat, chestnut, etc.) for centuries. That said, however, the gluten-free pizza & pasta that I was hoping would be readily available on every corner of Italy just wasn’t. We were extremely lucky to have found Chef Max though. The ultimate fabulous cooking experience.. iI would have loved to experience it myself.